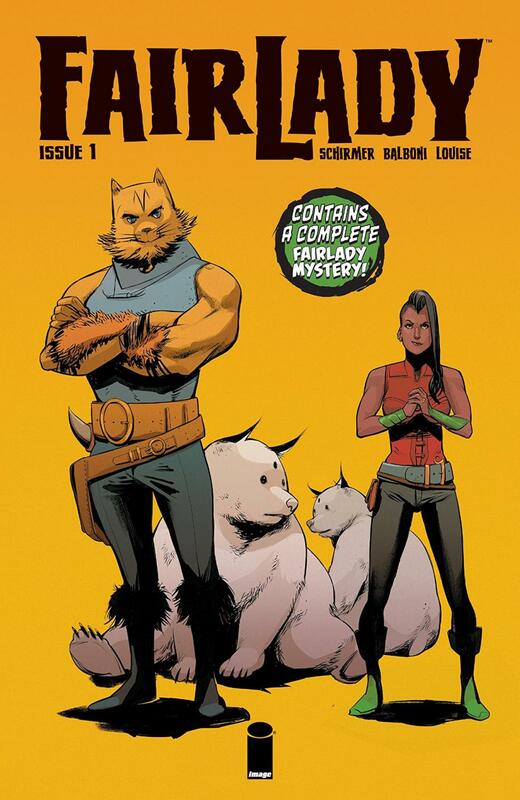 I always have fun getting to know a new series and Fairlady, after one issue, definitely has an intriguing enough premise to warrant coming back for more. Schirmer makes a good pitch for the book in the back matter (and on the cover) that each issue will have a self-contained mystery. Add to that that the lead character, Jenner Faulds, is somewhat of an anomaly in the world that Schirmer is creating, it proves to be an interesting read. This new series does two very good things from the start. Number one is to give a quick summary of the world and who Faulds is as a character. Number two, it gives a quick flash forward to showcase her partner, a humanoid cat thing named Nelja (from a species called Jessu) and his predisposition to hitting things that call him a feline. It’s a great start to the series because it sets a premise and a tone very early on. From there, it’s straight into the mystery of the day. As I don’t want to spoil anything relating to the mystery, I will say that it’s nicely constructed from beginning to end. It borrows from different sources in its presentation, namely I liked that they used a two-page spread to showcase the crime scene and the available clues. The small little drawback to the presentation is that it felt a little too “police procedural”. What I mean by this is that the story would jump from scene to scene, from suspect to suspect, almost like you were watching the front half of Law & Order. However, since this is the first issue, we’ll see if this style of storytelling stays the same or Schirmer will change it up. Before reading this first issue, I read in multiple places that Fairlady was being compared to another Image title: Saga. From a story perspective, it’s very different in all aspects (except the whole Sci-Fi/Fantasy mash-up). Where it is very similar to Saga is Claudia Balboni’s artwork with Marissa Louise on art. If you didn’t know that Babloni and Louise were the art team, I wouldn’t blame you if you thought it was Fiona Staples on art. It’s eerily similar. Not that that is a bad thing - I mean, look no further than all the Jim Lee inspired artists out there. There are flashes of uniqueness, however, throughout the issue, and I’m hoping that the uniqueness that Balboni brings comes more to the forefront in later issues. All in all, this was a really fun issue with its premise and done in one story. The fact that the issue is 30 pages long for the same price as most other issues on the comic rack and it includes some great back matter - a whole separate written mystery was added to the first issue - makes this comic good value for your money.